Health care professionals have told us that too much sugar is hazardous to our health. This is a guide about reducing sugar consumption. To reduce sugar consumption in your family, simply do not leave a sugar bowl on the table or counter. Keep the sugar in it's canister. I am amazed how my family will go without sugar in their coffee, on their cereal, etc. because they don't want to bother getting the sugar canister out. I save a lot of money yearly by not having to buy as much sugar. You can also cut the sugar in 1/2 in many recipes and no one can tell the difference. Less sugar is much better for your health, too! Nearly all cookie and brownie recipes can have their sugar reduced by 1 Tbsp. per cup of sugar without affecting the outcome. 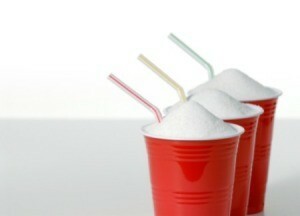 Do you wish you could reduce the amount of sugar you put in your drinks, but don't want to lose the flavor? I've got the answer. I did it with myself and have reduced my sugar in a regular size coffee mug from 2 heaping teaspoons down to a flat 1/4 teaspoon. My goal is to get to 0 sugar in my drinks. I've used the same method to reduce the sugar in my iced tea. I make 1 gallon jugs at a time. I started out putting 2 cups of sugar in 1 gallon. Now I put 1/4 cup in a gallon. It's not a quick method. It seems to take forever. But with persistence and patience anybody can do it. Before you know it, you won't even like it when you are served coffee or tea that is over-sweetened. It also takes thinking about it. But in the end it's worth it. Here's my method. The first thing to do is to get a shot glass. That makes it so much easier. Now. When you go to "doctor up" you coffee/tea (this is by the cup), scoop your sugar as you normally do, only put it into the shot glass, not your drink. Now, here's the secret. Take a 1/8 tsp measuring spoon and take out 1/8 tsp of the sugar in the shot glass and put it back in the sugar container. Put the rest in your drink and stir it up. If you want to reduce creamer, use this same method. Believe me you won't miss that 1/8 tsp of sugar or creamer at all in taste. Do this for about 2 weeks with every cup you drink. After 2 weeks switch the 1/8 tsp for a 1/4 tsp and do the same thing. Do this for about 3 weeks. Each time you increase the amount of sugar you take out, increase the time by one week. This gives your taste buds more time to adjust so that when you reduce your sugar again, you still won't notice the difference. After the 3 weeks of 1/4 less sugar, bring back the 1/8 tsp and do 1/4 + 1/8. Then 2 x 1/4. Always increase by no more than 1/8. When you get to where you are waiting 4 weeks between changes, keep it at 4 weeks, but every 4 weeks decrease your sugar by 1/8 tsp. Believe me your taste buds will adjust and you won't even notice it. As far as jugs of iced tea. Make 1 gallon at a time. Use the same method except decrease by 1/8 cup instead of teaspoon. But use the same schedule. It really does work and it's so much better for you! Before you know it even your doctor will be noticing the difference in you! And so will the scales! When reducing sugar in a baking recipe, does anyone know how much sugar can safely be reduced before it ruins the recipe - 50%-75%? The texture of some recipes is dependent upon the sugar in the recipe. Lemon Bars is one that I had a disaster with. It definitely needed the sugar. But if it not important for texture...and I guess only trial and error like my lemon bars is the only way to be sure. Otherwise, I replace the sugar with Splenda rather than reduce the amount. You can replace the sugar with a like amount of Splenda to replace half a cup of sugar, use half a cup of Splenda. If you think you might need the sugar for texture, only replace half of the total amount. In other words, if it calls for a cup, put half a cup of sugar and half a cup of Splenda. But, I repeat, my way is strictly trial and error. By the way, Yeast breads need that couple spoons of sugar so the yeast will "grow".